(Church calendar - Jan 28) Synaxis of Holy New Martyrs and Confessors of Russia (movable feast on Sunday, January 25th, if the date falls on a Sunday; in the previous Sunday, when January 25th falls on Monday, Tuesday or Wednesday; or the subsequent Sunday, if January 25th falls on Thursday, Friday or Saturday. Archimandrite Sergius, in the world Metrophanes Vasilyevich Srebryansky, was born on July 31, 1870 in the village of Tresvyatskoye, Voronezh uyezd, Voronezh province into the family of a priest. There were many children in the family, and they were brought up with great strictness, so that they used the formal “you” form of address to their parents. When a child attained the age of four, the father brought him to his mother and triumphantly declared that from now on the child could carry out all the fasts. In 1892 Metrophanes finished his studies at the Voronezh theological seminary. He did not immediately become a priest, but under the influence of populist ideas he entered the Warsaw veterinary institute. Here, among students who were indifferent to the faith, he began to go to the Orthodox Church fervently. Here also he got to know his future wife, Olga Vladimirovna Ispolatovskaya, the daughter of a priest. On January 20, 1893 they married. On March 2, 1893 Metrophanes was ordained to the diaconate, by Bishop Anastasius of Voronezh, and on March 20, 1894 – to the priesthood by Bishop Vladimir of Ostrog. He became priest of the 47th Tatar dragoons in the town of Rypin, Polotsk province, transferring to the 51st Chernigov dragoons in Orel on September 1, 1897. The colonel of the Chernigov dragoons regiment was Grand Duchess Elizabeth Fyodorovna. On January 15, 1904 the regiment was sent to Manchuria at the beginning of the Russo-Japanese war. Fr. Metrophanes participated with the regiment in the military actions near Lyaoyan and Mukden, and wrote down his impressions in his Diary of a Regimental Priest, published in 1906. On October 12, 1906 he was made a protopriest, and was transferred to Orel. In 1908 Grand Duchess Elizabeth was contemplating the establishment in Moscow of a women’s monastery of the type she had encountered abroad. Among the drafts of a rule of such a community was one submitted by Fr. Metrophanes. The Grand Duchess approved his draft, but was unable to locate for the sisters a spiritual father with the qualifications required by Fr. Metrophanes’ rule - he was to be a married priest who lived with his matushka not as a wife but as a sister. When she could not find such a priest, the Grand Duchess offered Fr. Metrophanes to take the position himself. He declined the offer; he loved his Orel parish and pitied his flock, who were loathe to part with their beloved spiritual father. Fr. Metrophanes was very popular in Orel; everyone respected him and sought his advice. “At the end of the Liturgy, after people had kissed the cross, they would continue coming up to me. With some I would talk, another would ask for advice, a third wanted to share his grief - and this would go on for hours. Meanwhile, matushka would be waiting with dinner, but I seldom left the church before five o’clock,” related Batyushka. However, as devoted as Fr. Metrophanes was to his flock, the Grand Duchess’s offer was considered almost as an order, and Batyushka did not dare refuse her. He promised to think it over, but as soon as he left Moscow, he resolved to decline. “On my return journey to Orel, I stopped off at an estate near Moscow. I went by myself for a walk in the park. My soul was churning with vacillating thoughts. I thought of my hometown, the tears of my spiritual children, and my heart was torn. I determined to turn down the Empress’s sister. And so I walked down the shaded alleys, delighting in nature’s splendour, in the flowers - when suddenly I felt that one of my arms had gone numb. I couldn’t move it. I tried to raise it but in vain: I couldn’t move my fingers, I couldn’t bend my elbow. My arm was totally useless! I was aghast. Of what use was I without an arm? I couldn’t serve! I understood that the Lord was punishing me for refusing to submit to His holy will. Right there in the park I began to pray fervently, begging the Creator to forgive me. I promised to agree to go to Moscow, if only the Lord returned the use of my arm. About two hours went by, and the paralysis gradually wore off. I returned home perfectly healthy and informed my parish that I had to leave them. Such an uproar! Tears, laments, sobbing... I myself wept together with my dear parishioners. They pleaded, they urged me to reconsider. I had promised the Grand Duchess that I would come to Moscow, but I did not have the strength to tear myself away from my beloved children, my dear parish. Months passed. Moscow was waiting for me, but I still delayed, vacillating. Finally I was persuaded that to part with my flock was beyond my powers, and I wrote to decline the position. Shortly thereafter I again lost the use of my arm, and again I was called to Moscow. Full of grief and despondency, I went to Moscow to the wonderworking Iveron icon of the Mother of God. It had been taken all over Russia, and when it returned to Moscow, people flocked to it. I stood in the crowd, my cheeks wet with tears, and asked the Queen of Heaven to heal my arm. I promised once again, firmly and resolutely, to accept the Grand Duchess’s offer and move to Moscow, if only my arm were restored and I could perform the Mysteries as before. Reverently, with fear of God and hope, I venerated the wonderworking image. I felt life return to my arm; my fingers moved! Then I joyfully informed the Grand Duchess that I had come to a decision and was moving to Moscow. In 1918, not long before her arrest, Elizabeth Fyodorovna transferred the community into the care of Fr. Metrophanes. In 1919, Patriarch Tikhon, who knew him well, gave him his blessing with a gramota and an icon of the Saviour, thanking him for his many labours. In 1922, with the blessing of Patriarch Tikhon and Elder Anatolius of Optina, Fr. Metrophanes was tonsured as the monk Sergius, while his wife became the nun Elizabeth. Soon after this he was raised to the rank of archimandrite. 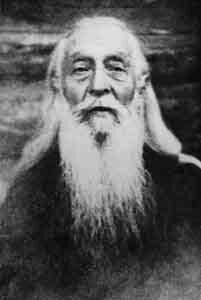 On March 23, 1923 he was arrested for reading the epistle of Patriarch Tikhon and cast into prison. On August 24 he was exiled for one year to Tobolsk. On February 27, 1925 he returned to the Martha-Maria convent in Moscow, but he was forbidden to give sermons or do administrative work. In 1925 the authorities decided to close the convent and exile its inmates. On April 29, 1926 Fr. Sergius himself was arrested for “anti-Soviet activity”. He was accused of saying that Soviet power was persecuting religion and churchmen. Fr. Sergius did not deny the accusation, but said that he never said this with spite, but was always hoping that the Soviet authorities would come to trust the clergy. Matushka Elizabeth, on hearing of his arrest, began to agitate for his release, and with her help on July 2 the OGPU released him from Butyrki prison. Fr. Sergius and Matushka Elizabeth moved to the village of Vladychnya, Tver province, which was matushka’s native village. At first Fr. Sergius did not serve, but went frequently to the church and prayed. Immediately he began to be visited by his spiritual children and soon acquired the reputation of being a holy man. In February, 1930 Fr. Sergius was arrested again. The main accusation consisted in the fact that he “is especially good at sermons, which he uttered for two hours at a stretch. In his speeches from the ambon he calls for unity and the support of the Church and the aims of religion...” On April 7 he was sentenced to five years’ exile in the north. Once he said: “Oh, if you only knew what it sometimes means to have a cup of hot tea! I was summoned from my prison cell for interrogation. However, I was in such a state that I could neither reason nor speak... The interrogator - God bless him - took pity on me and ordered that I be brought a cup of strong, hot tea. This revived me, and I was able to answer his questions. In 1933, because of his age, his illnesses and the work he had successfully carried out, he was released and returned to Moscow, where he remained for one day before going with Matushka Elizabeth to Vladychino. He was visited by his spiritual children and many suffering Orthodox, including several nuns of the Martha-Maria convent who were still alive. He was glorified by the gifts of clairvoyance and wonder-working. Thus once by his prayers he retrieved three lost cows of a young cowherd who had completely despaired of finding them, which threatened him and his family with a terrible retribution according to Soviet laws. Fr. Metrophanes was an optimist by nature. He believed that science would attain such a level that it would prove the existence of another, spiritual, non-material world. Then people would become convinced of the existence of God, they would come to believe in the immortality of the soul and there would be the “first resurrection”, i.e., the resurrection of the soul from the darkness of sin. “All the nations which Thou has created will come and worship before Thee, O Lord, and shall glorify Thy name” (Psalm 85.9). Fr. Sergius died from pneumonia in Vladychino on April 5, 1948. He was buried in the village cemetery in Vladychino. When, two years later, they lowered the grave of his matushka into the ground, the top of his coffin moved and revealed that the body of Fr. Sergius was incorrupt. Many venerators of the elder go to his grace and take earth from it for healing. В тебе, отче, известно спасеся еже по образу: приим бо крест, последовал еси Христу, и дея учил еси презирати убо плоть, преходит бо, прилежати же о души, вещи безсмертней. Темже и со ангелы срадуется, преподобне Сергие, дух твой. Издетска монашескую жизнь возжелал еси, преподобне отче Сергие, в нейже любовь Христову стяжав, пастырь добрый многим людем был еси, последи же и изгнание претерпев, венцем исповедничества украсился еси. И ныне, предстоя престолу Святыя Троицы, непрестанно моли просветити и спасти души наша. Чистотою душевною божественне вооружився, и непрестанныя молитвы, яко копие вручив крепко, пробол еси бесовская ополчения, Сергие отче наш, моли непрестанно о всех нас.